HES Botlek Tank Terminal (HBTT) B.V. is strategically located in the Port of Rotterdam. The terminal’s state-of-the-art infrastructure has ample deep-water berths and facilities which allow storage and transshipment of a wide range of liquid bulk products. The 420-metre long sea jetty is capable of simultaneously handling two large seagoing vessels and two river barges. The terminal more than doubled its capacity to 490,000 cbm in 2017 and is expanding its berth capacity accordingly. A large part of the capacity is used for storage of clean petroleum products while the remaining part is dedicated to biofuels. The current capacity of 490,000 cbm will however soon be expanded again as the next project will start on short notice. This expansion consists of 6 tanks for biofuels with a total capacity of 20,000 cbm. Storage tanks are equipped with fixed rooftanks with internal floating roof. The terminal is one of the most environment-friendly tank terminals in the world and is the first terminal in the Netherlands to be awarded the ISO 28001 certificate. 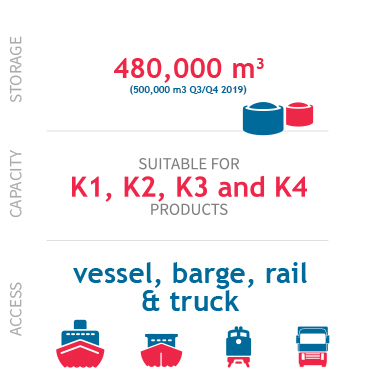 HBTT has a state-of-the-art terminal with ample deep-water berths and facilities for the transshipment and storage for a wide range of liquid bulk products. Safety and environmental protection are a high priority at HBTT. The company's management system is certified for ISPS, ISO 9001, ISO 14000, OSHAS 18000, ISO 28000 as well as Authorized Economic Operator (AEO). HES Botlek Tank Terminal provides customers with the safest, most reliable and efficient handling and storage solutions in the Port of Rotterdam. Products: Gasoline (components) diesel, biodiesel and renewable products. On nearby location Bitumen and Bitumen blend components. Expand the rail (un)loading system, currently used for biodiesel only, with services for a wide range of clean petroleum products. Expand capacity for petroleum products with 138,000 cbm for transportation fuels to meet continuing customer requirements. Possibility for pipeline connection to neighbouring companies. The discharge needs to be done using certified hoses suitable for products being discharged. The ship/agent will be responsible for supplying, connecting and disconnecting these hoses. The new facility will further HBTT’s ambition to offer all modes of transport and is a response to growing customer demand for rail transport. It will be used initially to load and unload block trains with biodiesel to and from Germany, Austria and Italy. Driven by growing customer demand for rail transport, throughput is expected to rise quickly, from approximately two trains a week to one train a day. The facility can also be modified to handle other oil products in the future such as aviation fuels, gasoline, diesel and edible oils. Regarding the medium term, throughput could increase to two trains a day. Safety is an ever-ongoing process. Scientific research renders new insights yearly to improve the safety of tank storage companies' business processes. In terms of safety, HES Botlek Tank Terminal endeavors to anticipate future developments in as far as this is possible. The safety management system is in accordance with NTA 8620. HBTT is a voluntary member of the industrial Fire Brigade. It is also Labour Inspection certified. Because HBTT finds safety to utmost importance, together with industry association VOTOB, the Safety Maturity Tool, we continually strive to improve our safety standards. For more information on the Safety Maturity Tool, please see the website of VOTOB.